Increase efficiency and safety for your employees while decreasing your liability with an Inclinator Commercial Dumbwaiter from IronHawk Elevator. Does your business require the transport of heavy objects of any kind to different levels of the building? Let IronHawk Elevator install a quality dumbwaiter from Inclinator to lighten the load. IronHawk Elevator is your trusted authorized dealer of Inclinator dumbwaiters, the best in the industry. Protect your employees and decrease the chances of an injury on the job. Create a convenient and safe way to move heavy material up and down stories of your commercial, government, or institutional building. There are many benefits that come with having an Inclinator commercial dumbwaiter installed in your business. Besides the convenience of moving food, medical supplies, office supplies, legal documents or any heavy objects you need to move to and from different levels of your building. Commercial dumbwaiters from IronHawk Elevator also offer the luxury of saving time and energy. Multiple trips up and down stairs can take a lot of time and it can put a strain the body. For employees who frequently carry supplies big and small to different areas of a hospital, restaurant or office building a dumbwaiter will increase productivity while minimizing the chances of a work-related injury. Protect yourself as a business owner and avoid those costly worker compensation claims. The safety of your employees depends on your ability to create a safe and functional work environment, especially in trades where the transport of supplies solely relies on the individual. 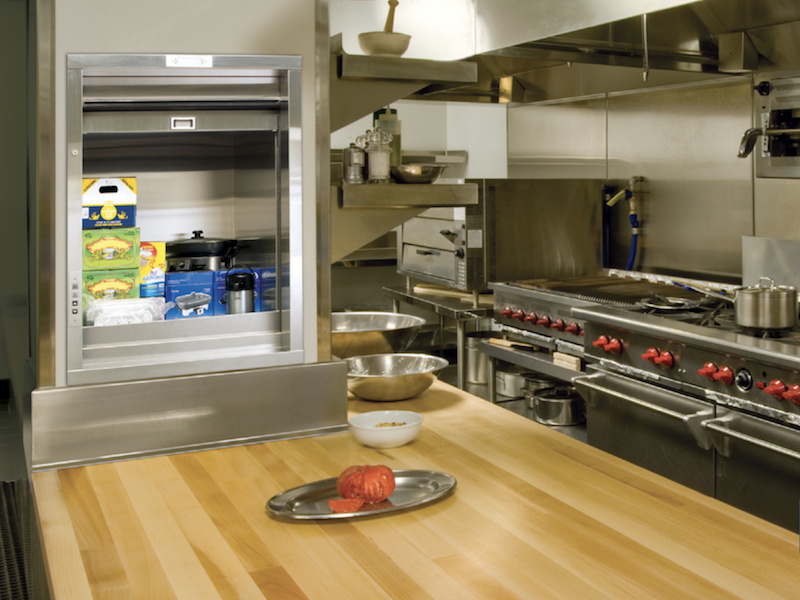 By installing a commercial dumbwaiter, your employees are safe to move supplies up and down without using stairs. This can save them from aches and pains that stem from poor form or lack of physical stability while handling heavy loads. Medical labs and clean rooms are often sterile environments and supplies must remain in the realm of cleanliness, dumbwaiters are the perfect solution for transporting sensitive materials that could potentially get destroyed or contaminated if removed from a sanitary environment. ​Inclinator dumbwaiters are designed with strength and integrity at the core, with some models being able to move up to 500 pounds with continuing use. Cabs come in standard powder-coated steel or in stainless for a mirror like finish. Heavy duty steel or aluminum make up the railing system, combined with motor/gears that require little to no maintenance which makes for a quality dumbwaiter. ​Each commercial dumbwaiter features optional state of the art technology such as smart controllers, text display and direction indicator for the sole purpose of quality and convenience. Inclinator dumbwaiters have a streamlined design making it easy to fit into your existing décor but also have custom options for that extra level of concealment. IronHawk Elevator has trained and skilled technicians who can install an Inclinator dumbwaiter for your commercial, institutional or government building. No matter the application or usage, we service customers from office buildings, restaurants, hospitals, libraries, medical facilities, financial institutions and other government buildings. Builders and property owners looking for powerful cost-effective solutions to moving high volumes of supplies floor to floor choose IronHawk Elevator. If your building has an existing dumbwaiter and is in need of updating, we are your go-to team for repair, maintenance and modernization. Save time and money by installing or modernizing a commercial dumbwaiter with IronHawk Elevator. Contact IronHawk Elevator today to find out more information on the benefits and value of a commercial dumbwaiter for your business. Inclinator commercial dumbwaiters can carry loads of up to 500 lbs. Increase safety and reduce your liability as a business owner or property manager. Improve efficiency and productivity from your staff.